Sold by the artist to Clark, December 1877 (£70). Myles Ariel Clark; Christie's London, 30 April 1906, lot 27 (£47.5s to Mitchell). with M. Newman Ltd, London, 1962.
with Gavin Graham Gallery, London. The artist's own sale record, 1877. F. Lewis, Benjamin Williams Leader R.A., Leigh-on-Sea, 1971. Country churches were always favourite subjects of Leader's; especially those in the villages of his birth county, Worcestershire. 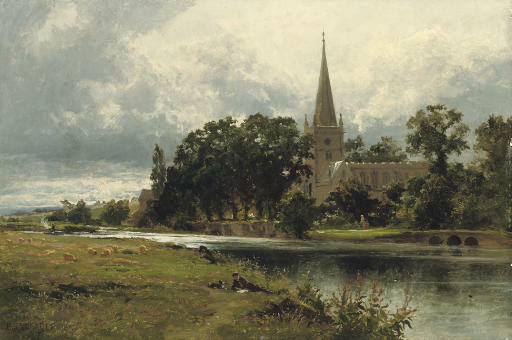 In this landscape, the early thirteenth-century Holy Trinity Parish Church at Stratford is viewed across the River Avon. It is the church where William Shakespeare was baptised and is buried. There is a larger, more finished version of this scene which Leader has dated 1878.